Just in time for Christmas, the U.S. Energy Information Administration estimated how much fossil fuel we’ll be using in 2040. Guess what? It’s more than we use now. Total primary energy consumption grows by 12% in [our] Reference case, from 95 quadrillion Btu in 2012 to 106 quadrillion Btu in 2040 … The fossil fuel share of energy consumption falls from 82% in 2012 to 80% in 2040, as consumption of petroleum-based liquid fuels declines, largely as a result of slower growth in VMT [vehicle miles traveled] and increased vehicle efficiency. So, doing the math, we used 77.9 quadrillion Btu of fossils in 2012, and will use 84.8 quads in 2040. The 2% gain in alternate fuels will be swamped by growth. Coal use declines proportionately, but grows absolutely from 20.6 quads in 2012 to 22.6 quads in 2040. And here’s a kicker: natural gas production increases from today’s roughly 66 billion cubic feet per day to about 103 Bcfd! Burning all that fossil fuel will add 5,599 million metric tonnes of carbon dioxide to the atmosphere in 2040, the EIA says, up from 5,481 million tonnes in 2011. By interpolation, each year in between will add a similar amount. Should the EIA’s Scenario Be the Basis for National Energy Planning? The EIA’s forecast methodology is notoriously conservative. It assumes no fundamental changes in the economy, the environment, laws, or regulations, and more or less extrapolates present trends. But the US can’t add 5.5 billion tonnes of CO2 to the air for the next 27 years without consequence. Combined with the emissions of other countries, that added accumulation will disrupt the projection itself. The EIA would rightly be criticized for trying to predict when the climate will collapse. But extrapolating present trends is equally incredible. Surely there must be some nod to the unsustainability of fossil fuel use at this pace and scale. Weren’t we supposed to be approaching 20% of 1990 emissions by 2040, rather than 120%? 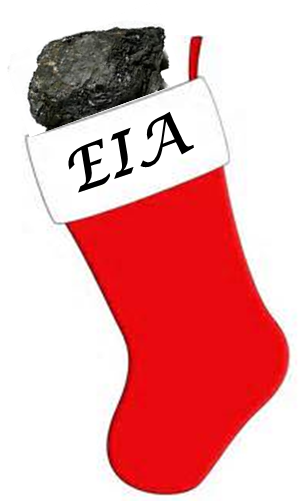 On the other hand, the EIA is telling us indirectly and incidentally that we’re failing to address climate change. This is true not only for policy, but for practice. All our voluntary and state-level measures aren’t deflecting the trends. Sure, we can argue they’d be way worse without those measures. But the bottom line is, we’re not even turning the corner on this problem. We’re throwing carbon in the face of every scientific projection of the disastrous consequences of maintaining our present emissions path. One data point the resolutely apolitical EIA declines to project: the CO2 content of the atmosphere in 2040. If we continue to pump 5.5 billion tonnes of CO2 into the sky every year, and the rest of the world holds its present rate of emissions, the atmospheric concentration of CO2 will increase by about two ppm per year. By 2040, it’ll be around 450 ppm. Agriculture, energy production, and the entire economy will fall off a cliff far sooner than we’ll hit 450 ppm—when the ice cap melts under that hot blanket of CO2. We must tighten the noose around coal, before this 2099 graduation speech becomes real. 70 more years?